This is one of the earliest pictures in the National Gallery, dating as it does from the later part of the 13th century. 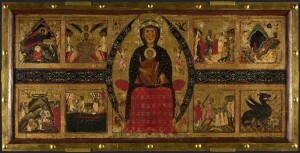 We can see the Virgin Mary seated on a throne decorated with lions’ heads, and Christ enthroned in the lap of Mary. They’re both within an oval shape, called a Mandorla, which represents the heavenly realm, and which also contains a couple of angels swinging incense burners. Around it are the symbols of the four evangelists – Matthew the angel, John the eagle, Mark the lion and Luke the bull. We then have eight panels in the earthly realm that contain scenes from the lives of various saints. This entry was posted in five minute presentations, National Gallery and tagged margarita d'arezzo on 17/06/2015 by donbrown.